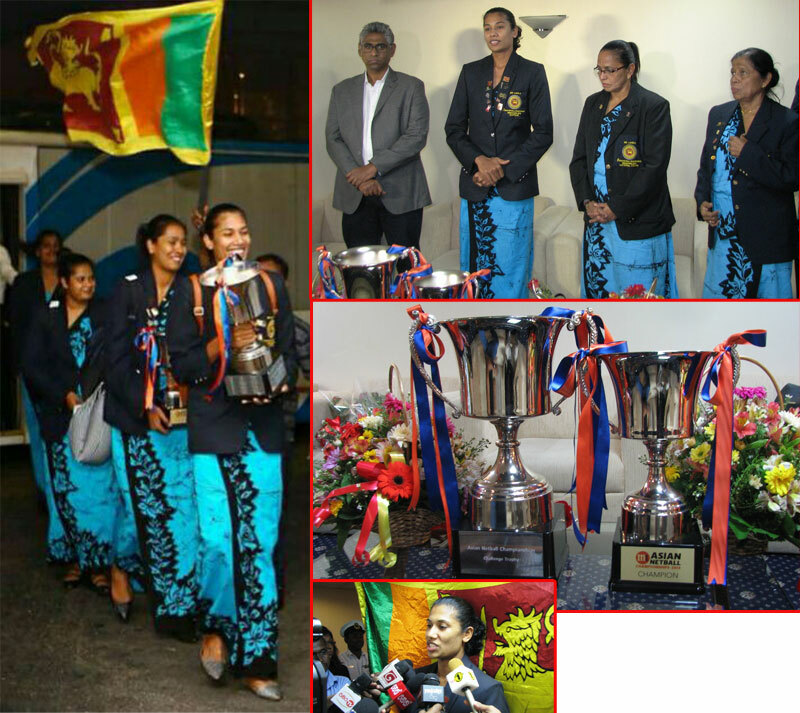 Sri Lanka team who won the Asian Netball championship after 9 years returned to Sri Lanka celebrating their victory. 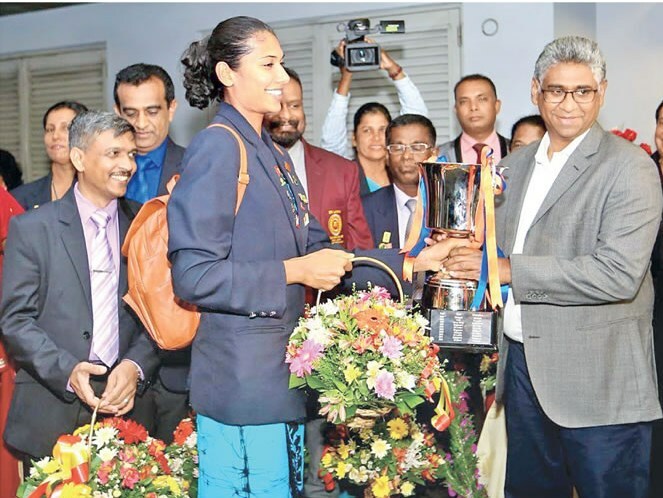 The reception for the Sri Lankan Netball team skippered by Chathurangani Jayasuriya was held at Katunayaka International Airport with Sports Minister taking prominence. 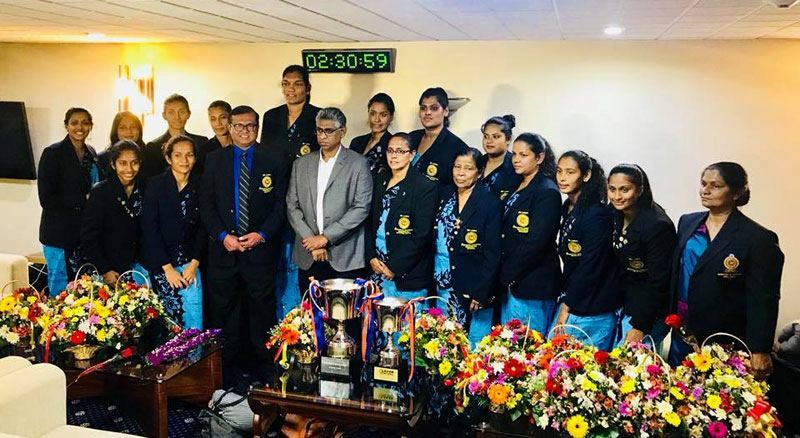 Officials of the Sports Ministry, President of Sri Lanka Netball Association, Mrs. Trixi Nanayakkara and officials of the netball association joined in on this occasion. as a team and came on this journey with coach Mrs. Thilaka Jinadasa. We trained for about eight months. At every moment we stuck to instructions of our coach ... worked with the team spirit. Stuck to our training with great determination and faith. We in fact had a purpose that we'd somehow or other get this victory". This is what coach Thilaka Jinadasa said: "I allied for the position of national coach previously in 2011 and 2014. But I failed on both those occasions to get that chance. Not because of my weakness ... but because of our stereo typed political system. In any case I managed to get that opportunity. I had faith that if I got the opportunity the team could clinch the Asian trophy. As a player too I have played for my country for 12 years. I have gone for the Olympic Games festival also. I have contributed for three wins out of the five Asian Cup tournaments where we have been winners. In one of those, when we won the Asian Cup in 1997, I happened to be the vice captain of the team. The next tournament of 2009, we were victorious. Now I function as the coach of the 2018 tournament. Not by talk ... I have gives my utmost to the country by action". In the meantime, the tallest player in Sri Lanka's team about whom the whole country speaks, Tharjani spoke humbly this way: "Everybody says that it was because of me that we won. It's true that my height was a contributing factor ... but just because the height is there, we can't win. Without support of others even I can't get positive ratings".